Kelly J. Baker (April 2016). Posted in 21stCenturyCulture, 21stCenturyMinistry. While driving my seven-year-old to a doctor’s appointment for what was likely an ear infection, I noticed that the car was unusually quiet. Rain pattered on the windshield, and the wipers provided their usual rhythmic swishing sound. But my oldest kid is a talker—her waking hours are filled with questions, comments, knock-knock jokes, and observations—and she was being uncharacteristically silent. I glanced in the rear view mirror to see what had captured her attention, expecting to see her engrossed in a new chapter book or one of her Fancy Nancy stories. She looked thoughtful and a little concerned. “Obey him?” I repeated slowly as I tried to figure out what she actually meant by this question. She had recently completed a unit on King in her first-grade class. When each student created his or her own “I Have A Dream Speech,” my daughter’s dream was that “people with money” would spend it to help those who didn’t have much . . . and that people would be treated fairly. As most parents can attest, fairness is hugely important to seven-year-olds, including mine. She can quickly discern whether something is fair and loudly proclaims, “That’s not fair,” when it isn’t. Like most children her age, she is excellent at detecting injustice in her own life. But I think it’s important for her also to understand the importance of fairness in the grander scale of history. Regardless of how extensively I engage in anti-racism work, my discomfort never seems to go away—and frankly, I don’t want it to. Discussions of racism should make us uncomfortable, because racism is an uncomfortable reality. Therefore, on Martin Luther King, Jr. Day, I made a point of reading King’s most famous speech aloud with my daughter. I wanted her to hear his words and to understand how he fought for racial equality and against segregation (which she now describes as a “rule” that she hopes never comes back). I also wanted her to know that King operated within challenging frameworks of systemic and structural injustice. While her school curriculum had done a good job inviting students to celebrate great individuals in the Civil Rights Movement, it hadn’t spent much time explaining the pervasiveness of the inequality that those individuals had fought against, which was unfortunate, because I want my daughter to recognize that the injustices of the past still exist in different forms today. I felt uncomfortable about my response. I thought, “I’m not doing this right, and this conversation is too important for me to screw up.” I suddenly realized what was bothering me: the phrase “some people” was too vague and made me complicit in the “colorblind” approach to race that I despise. I started to correct my mistake, but she intervened. “I don’t entirely understand it either.” What I didn’t confess is that I’ve spent years trying to figure out racism and white supremacy, and I still have no easy answers for such a large problem. I keep writing about racism because we need to keep talking about it openly and honestly, so that we can work against it. Ignoring or avoiding racism is a privilege only white people have. I can’t abide that kind of privilege any longer, and I don’t want my daughter to, either. She was silent for a minute, then two, and then five. I listened to the rain drip-drop and waited to see what would happen next. “Mama, I want to be just like Martin Luther King, Jr. when I grow up.” It was not the first time she’d said that. I grinned at her in the mirror. We can’t dismantle racism with silence and avoidance. To confront racism, we have to learn to talk about it. Churches can start these conversations, especially with the children who attend their services. This conversation has replayed in my mind in the weeks since it occurred. I’ve written about racism for years, but I’m still uncomfortable talking about race. And I know I’m not alone; my sense of unease is shared with many white Americans, who often seem to be terrible at talking about racism and its consequences for people of color. The problem can seem so overwhelming, especially when we confront the fact that racism is never just the work of racist individuals. It also permeates our institutions. Regardless of how extensively I engage in anti-racism work, my discomfort never seems to go away—and frankly, I don’t want it to. Discussions of racism should make us uncomfortable, because racism is an uncomfortable reality. But if we truly want justice, we need to acknowledge and get over our own anxieties, so that we can talk about racism with children and adults. We can’t dismantle racism with silence and avoidance. 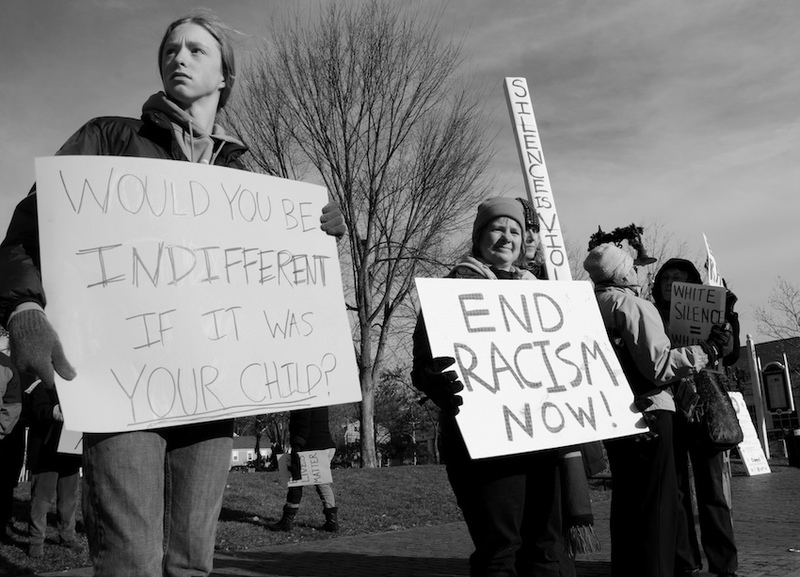 To confront racism, we have to learn to talk about it. Churches can start these conversations, especially with the children who attend their services. At a time when many children (and adults) lack opportunities to practice talking about race, churches can serve as safe spaces for engaging in difficult discussions. Children’s ministries, in particular, can help kids learn to talk about racism and race in honest ways. Studies show that teaching children colorblind approaches to race—which emphasize not “seeing” people’s race or ethnicity—creates more race-based exclusion, rather than less. This isn’t surprising. When we don’t explicitly talk to children about race, they adopt the racial assumptions and bias of the culture surrounding them. All too often, whiteness emerges as normative and privileged. What we need, then, are more open, transparent discussions of race and racism. So, start conversations among church members, young and old alike. Engage them honestly. Create spaces in which they can practice talking about racism, because the more we practice, the more inclined we are to engage others in these crucial discussions. Due to their innate understanding of what is fair (and what isn’t), children are primed to think about inequality and the necessity of justice. Therefore, when we don’t talk to kids about how racism shapes the world around them, we miss out on opportunities to promote justice. When I am willing to discuss uncomfortable issues despite my discomfort, I show my daughter that she, too, can talk about hard topics that make her uncomfortable. And talking openly about racism in this moment is a necessity, because the consequences of racism are dire. The poet nayyirah waheed writes, “to not be safe on the earth/ simply/ because/ of the color of your skin/ how does a being survive this.” I’ve read this poem over and over again. How does a being survive racism? How can you live in a society that is dangerous to you because of the color of your skin? Her poem is entitled Trayvon Martin. Many don’t survive. Many never have a chance to survive, much less thrive. White people have to start talking about racism with our kids and with each other. This is how we start to make things fair. This is how we move toward justice. 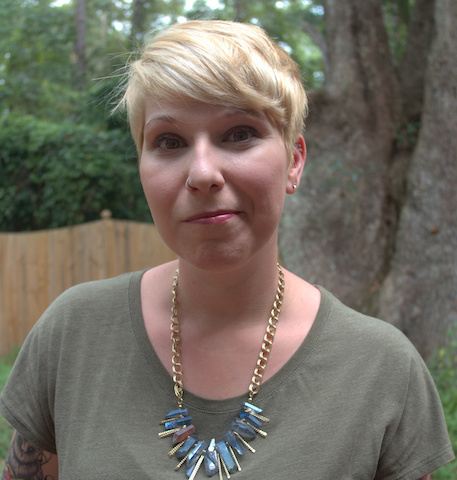 Kelly J. Baker is a freelance writer with a religious studies PhD who covers higher education, gender, labor, motherhood, American religions, and popular culture. She has regular columns at the Chronicle for Higher Education’s Vitae project, Women in Higher Education, Killing the Buddha, and Sacred Matters. She’s written for The Atlantic, The Rumpus, The Manifest-Station, The Washington Post’s “Faith Street”, and Brain, Child. She is the author of the award-winning book The Gospel According to the Klan: The KKK’s Appeal to Protestant America, 1915-1930 and The Zombies Are Coming! : The Realities of the Zombie Apocalypse in American Culture. When she’s not writing essays or wrangling two children, two dogs, and a seriously mean cat, she’s hacking away at a collection of essays on apocalypses in America tentatively titled The End of Us. You can find her on Twitter, Facebook, or her blog. Cover: United Nations Photo, “Apartheid: The Tyranny of Racism Made Law,” January 1, 1982. Via Flickr. Licensed under Creative Commons CC BY-NC-ND 2.0. Inside: Tim Pierce, “Would You Be Indifferent If It Was Your Child?” December 7, 2014. Via Flickr. Licensed under Creative Commons CC BY 2.0 /Desaturated.